STRI Group, the world’s leading sports turf consultancy, has announced the training dates of its amenity sector qualification courses. The professional training courses take place during autumn and winter 2017 at STRI’s HQ in West Yorkshire, and include both introductory and professionally recognised qualifications. Courses consist of BASIS (Amenity Horticulture), Foundation Award in Amenity Horticulture, Fertiliser Advisers Certificate and Training Scheme (FACTS) and Nutrient Management Planning (NMP).Each qualification is recognised by BASIS, the independent standards setting and auditing organisation for the pesticide, fertiliser and allied industries. In-depth training, and dedicated student support, will be provided by STRI research field experts, Dr Ruth Mann and Dr Christian Spring. 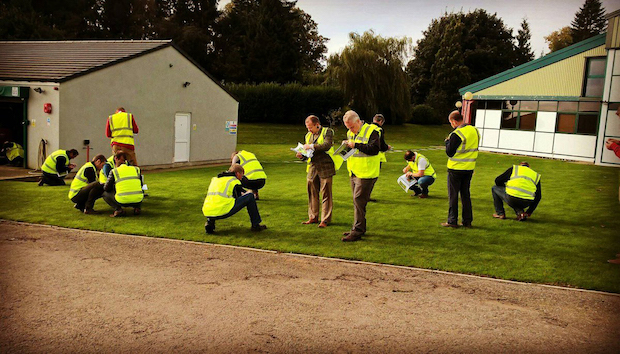 STRI’s training courses allow individuals to build their skills and confidence by keeping their knowledge up-to-date, and enable career progression within the amenity industry. Courses include dedicated turf sessions, which have been specifically developed by STRI, to meet qualification requirements. Courses will be held at STRI’s world-class research facilities in Bingley, and food and refreshments will be available. Andrew Kerr, Head Greenkeeper at Surbiton Golf Club, said: “As a qualified greenkeeper and having been in the industry for 20 years, I thought that I knew a lot about being an agronomist – that is until I was introduced to BASIS. I completed the Foundation BASIS at Harrogate and this encouraged me to do the Professional BASIS. The BASIS Certificate in Crop Protection – Amenity Horticulture is the national qualification for all field, sales and technical staff (FSTS) who advise on the use, selling or supplying of plant protection products in the amenity industry, head greenkeepers, head groundsmen, and course managers. The Foundation Award offers an introduction to understanding turfgrass management, including the use of professional pesticides in the Amenity Horticulture sector. The course is ideal for deputy greenkeepers, groundsmen and landscapers who wish to then pursue full accreditation through attainment of the BASIS Certificate in Crop Protection – Amenity Horticulture. The FACTS Turf Certification and Training Scheme is an independent scheme for advisers in plant nutrient management. This course provides a fundamental understanding of fertilisers, turf nutrition, and the environmental impacts of fertilisers. The NMP course has been designed for FACTS (Turf) Qualified Advisors to update their expertise on fertiliser issues and legislation. The NMP training is compulsory for current FACTS Qualified Advisers and those gaining the qualification, to maintain their FQA status. For more information on any of the courses, or to book a place, please call STRI Head Office on +44 (0) 1274 565131 or email: enquiries@strigroup.com.